Don't worry--she grew into those ears (but she still has that defiant stare). It's hard to believe that in two short months another lambing season will already be here. Before you know it, there'll be bouncing baby lambs everywhere. There's a broccoli on my broccoli! Farmgirl Fare currently in 1ST PLACE! Just a note to let you know I really enjoy your blog and photos. Just as an encouragement to all of the other readers of the Farmgirl's blog, and those who enjoy her photography: hurry over to http://2007.bloggies.com and nominate her for "Best Photography of a Weblog"! Oh my, how cute, I can't wait to see all fo the babies this year! is that my baby? What a cutie! They really are adorable, aren't they? 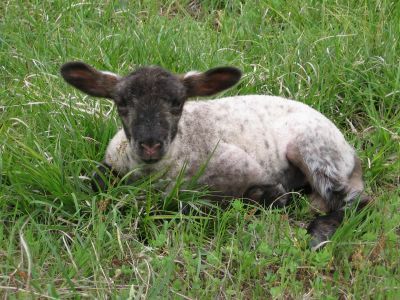 I was looking through some lamb photos yesterday and couldn't believe it when I came upon those ears. She looks like such a lady now. And of course all her spots are gone. And no (for those of you who are inevitably wondering, she doesn't have her "C" name yet. I really need to get on the ball with that, seeing as the "D" lambs will be born soon, LOL. Well aren't you sweet? Thanks! What a wonderful surprise to hear from you. So glad you are back! I came, I voted, and now I am ready for bouncing baby lambies. I can't wait. It's my favorite time of the year! So will this generation have names starting with a D? If so, I am starting my list!